Vivekananda Kendra Kanyakumari-Andhra Pradesh Praant organised two Kendra Parichay-Baithaks as part of the efforts to start activity centers in AP. The first of these was organised in the Vivekananda Centenary High School, Ajith Singh Nagar, Vijayawada and was inaugurated by Revered Swami Sannihvasananda, Sannyasi, Ramakrishna Math and In-charge of the Ramakrishna Mission's Sub-Center at Gandhinagar, Vijayawada. In his address Swamiji dwelt on the significance of Swami Vivekananda's mission to the West and his clarion call In India to take up organised work to spread the message of Bharat to the rest of the world. Justice CV Ramulu, Retd, Judge of the High court of AP and Praant Sanchalak, Vivekananda Kendra Andhra Pradesh spoke on the Vivekananda Kendra work and need to start activities of the Kendra in Vijayawada. Sri Uday Bhaskar, Karyakram Pramukh conducted the programme that was attended by 77 people (41 brothers and 36 sisters) from 3 districts-Krishna, Guntur and West Godavari. The second Kendra Parichay Baithak was organised in the Venkateswara Swamy temple, Ring Road, Vizianagaram. 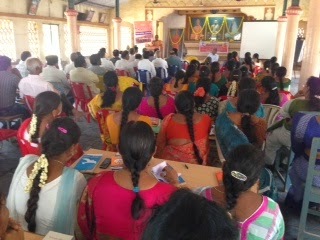 Sri Krishnam Raju, Secretary, Vijnana Vihara, Gudilova conducted the programme that was attended by 45 people (12 women and 33 men). Kum. Sujatha, Jeevanvrati and Praant Sangathak, Vivekananda Kendra Andhra Pradesh Praant, spoke on ideals and activities of the Vivekananda Kendra Kanyakumari. With the consent of all concerned a Karyasthan Samiti for Vizianagaram was formed. In view of the Mananeeya Eknathji Janmashati Parva, complementary teams to guide and organize activities were also formed.